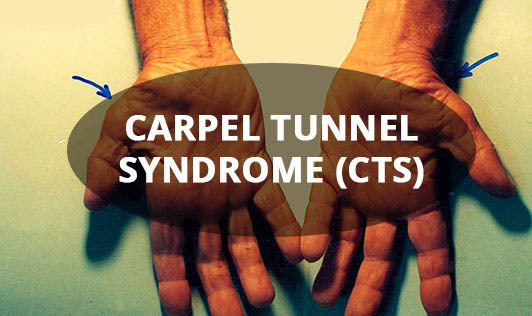 Carpel Tunnel Syndrome affects the hand and wrist. This disorder happens when the median nerve, which runs from the forearm to the wrist, becomes pinched, squeezed or pressed at the wrist. • Excessive use of your hand and wrist. • People with diabetes are prone to CTS, which is a common feature of diabetic neuropathy. Neuropathy involves decreased or distorted nerve function particularly affecting sensation. Symptoms include numbness, tingling, weakness usually starting in the fingers and toes and moving up to the arms and legs. • People who undergo hemodialysis for chronic kidney damage experience a build-up in the hand of a protein called beta 2-microglobulin resulting in CTS. • Drastic hormonal fluctuations like those likely to happen after a woman has had a baby. Such fluctuations cause fluid retention causing swelling in the body. Fluid retention is one reason that CTS develops during pregnancy. • Numbness of the fingers. • Use a wrist support/mouse pad while using the system. • Stretch your wrist every hour to avoid stiffness of joints. • Do not keep your wrist on mouse for a long period of time. • Strengthening palm muscles:- Clench the fingers of one hand into a fist tightly. Release, fanning out the fingers. Do this five times. Repeat with the other hand. Hold a soft ball in your hand and press it with your fingers. Do it ten times. Repeat with other hand.